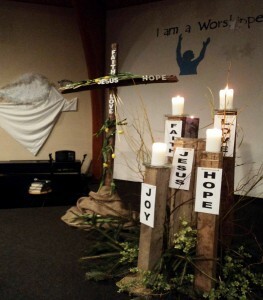 A growing trend at our congregation – Hope Church in Port Perry – is the visual presence of artwork in the sanctuary and throughout the church building. In the past, we have had ladies who would stitch up beautiful banners and design lovely arrangements at Christmas, Easter and Thanksgiving. 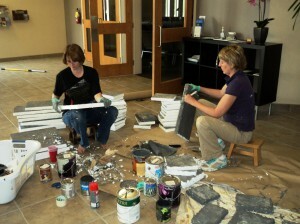 But something new is being forged that goes beyond the typical decorating committee that we have had in the past. 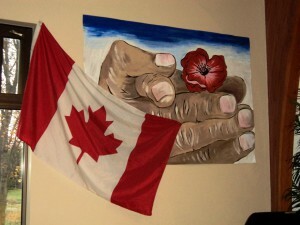 The artwork is not stand alone pieces of art nor are they the “pull out of the storage closet” banners that follow the church calendar of events. The artwork that is emerging now are pieces that are specifically designed in collaboration with the pastor so that the art ties in with what is being preached from the pulpit. These pieces are kept up for as short as one week or as long as a season. Their purpose is to offer a visual meditation for the congregation as they hear the word of God spoken from the pulpit. This of course is not something new in Church history. Before the printing presses could manufacture the Bible, artists created a visual testimony in the early churches through their work. Congregants then, who might not understand the spoken word of God, were still reached in visual form. Today, not least because we want newcomers to understand the faith, the visual form of God’s word attempts to bring the spoken word to life in our realities of daily life. Just as the musical worship team selects songs that tie in with the pastor’s message, a new addition to the worship team is being brought in to do the same … the visual artists! Identify members of your congregation that have creative, visual art talents and a desire to communicate God’s word to the community. Host regular meetings with your pastor and the visual artists to discuss the calendar of sermon series and topics. Use this time to brainstorm how those themes can be brought to life in visual forms – think outside of the box and not just traditional banners! Pray together asking God to show you a visual form that he wants used in the service. Visual forms could be as simple as draping coloured cloths from the walls or ceiling, or as complex as hanging a flock of paper doves from the ceiling and throughout the church building. Give yourself the freedom to be simple at times, and at other times to do something radical! 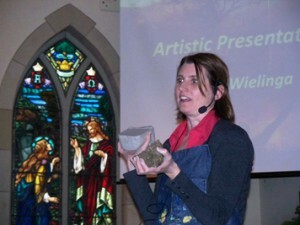 Carve out a reasonable working budget for the visual arts in worship. Take pictures of each representation and develop a visual book of records of how God has directed you. You can then use these pictures in a digital power-point review, perhaps at a New Year’s Eve program, to help summarize the teachings of the past year. Linda Wielinga is an artist from Port Perry, Ontario. Linda Wielinga is a member at Hope Church in Port Perry where she has found the freedom to work with others using their artistic talents in the development of worship in the life of the church community. She currently works as Director of Communications for Knox Christian School and Durham Christian High School in Bowmanville, Ontario.